How to remove dog poo from your carpet. Hopefully it is something you won’t have to deal with. BUT if you do, don’t panic. We can help you. 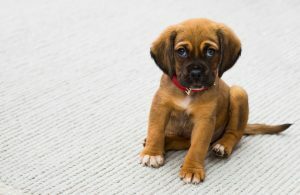 Read our simple step-by-step guide on removing dog poo from your carpet. What’s the best method for removing dog poo from my carpet? Scrape off as much as possible. A spatula or blunt knife should do the trick! Then allow to dry. I know you are probably desperate to scrub the carpet as quick as possible. Or you want to dive into your cleaning cupboard. But just wait – this step is important! Once dry, vacuum the affected area. Okay, now you can open your cleaning cupboard! You need to find some biological washing machine liquid, pour a small amount onto the carpet so it covers the stain and and leave for 15 minutes. Next, remove the liquid with a spatula. Now get a damp cloth and dab the area, following with a dry cloth to soak up any remaining liquid. You can repeat step 5 if there is still a stain. In the majority of the cases, your carpet should be looking and smelling fresh once again! What happens if there is still a stain? If the above method doesn’t work, then give Careclean a call on 01245 323989 to book in your free no obligation quote. We will arrange to visit you at a convenient time and talk through your cleaning options… and if you need some tips on removing general stains, click here for our top tips! If you don’t live in Essex, visit the NCCA website to find your local approved carpet cleaner. Careclean has been established since 1984 and has a vast knowledge of carpet and upholstery cleaning and maintenance. We post a weekly blog, which often includes carpet and upholstery cleaning tips and guidance on keeping your home clean and healthy. Click here to check out our blog. You can also follow us on Twitter and Facebook to keep up to date on all the latest news and offers.